Director / Writer: Robert Hall / Cast: Bobbi Sue Luther, Kevin Gage, Sean Whalen, Lena Headey, Thomas Dekker, Johnathan Schaech, Nick Principe, Anthony Fitzgerald, Jana Kramer. 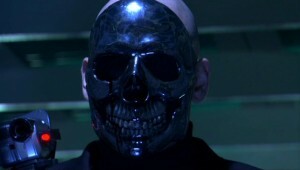 A young woman wakes up in a coffin in a morgue and within five minutes finds herself on the run from a knife-toting maniac with a chrome skull mask (Chromeskull). She already establishes that she cannot remember anything during one of those rare-in-the-genre successful calls to the cops, which is cut short when she wanders too far from the phone and pulls the cord out. The Girl, never attributed a name, escapes Chromeskull and his shoulder-mounted camera for long enough to be picked up by Kevin Gage, who takes her home to Lena Headey and they say they’ll take her to the police in the morning as, conveniently, they don’t have a phone at all. Chromeskull turns up and kills Lena and the others go on the run, picking up dorky neighbour Stephen on route, whose mother has just passed away. The trio find that the local copshop has already been hit by Chromeskull and find their way back to the mortuary, looking for answers, which they find in a nearby barn containing numerous coffins containing dead bodies containing gruesome injuries. A stack of video cassettes contain the gruesome details of the murders and there’s some blah about a tri-state serial killer.. Eventually, the group end up in a store, stalked by Chromeskull all the way, who offs a couple more dunces before going head to head with The Girl, who we finally learn the origins of. Notable for its gory demises, Laid to Rest is a chase movie with the killer doing all he can to get The Girl back into his clutches. Visceral offings include knives through the mouth, head and neck, a head that bursts when pumped full of a homemade poison, another that explodes upon contact with a shotgun blast and, finally, The Girl gets her own back on Chromeskull, ensuring he certainly won’t be back for a sequel. Luther makes and acceptable heroine and both Gage and Whalen as her thrown-in-the-deep-end wouldbe saviours do very well with some neat one-liners but the film’s heavy reliance on its gore quotient and disinclination to explain anything about the killer’s identity rob it of the air of humanity we need if we’re going to root for the innocent party over the antagonist. Worth catching for its creativity and striving to do something different. Blurbs-of-interest: Johnathan Schaech played the killer in the dismal Prom Night remake; Kevin Gage was in May; Thomas Dekker is in the 2010 remake of A Nightmare on Elm Street. In all fairiness, it’s a prequel isn’t it? Nope, sequel through and through. ChromeSkull is scooped up and pieced back together by his minions… yes, he has minions, the main ones being Danielle Harris (who reminded me of the Baroness from G.I. Joe) and Megan Fox’s husband. He ends up looking kind of like Cropsy. Yeah, when I first heard about the sequel’s plot, I had a lot of doubts, but then I watched it and the end result was passable, at least enough to get me wanting to see another. Probably the first slasher in which the killer is rich enough to hire people to help him with his serial killing, having them build him weapons and set up new torture chambers and whatnot.